For your convenience, we accept Visa, Master Card and American Express (subject to a 3.00% order processing fee). Cheques, Cash and PayPal are also accepted. 400 cookies for bulk and 100 cookies for custom. Can they be chocolate dipped? Do you have flavours? 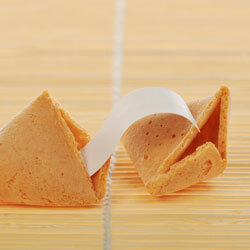 Yes, we have chocolate dipped fortune cookies and flavoured fortune cookies. Please call 1-800-296-5408 or in the 416/905 please call 416-787-6436 to discuss. Chocolate dipped cookies are not available May through October. 2-3 weeks. Shorter lead times are available and subject to applicable RUSH charges. Can I put the message in a different colour or font? Yes, Please call toll-free 1-800-296-5408 or in the 416/905 please call 416-787-6436 to discuss. Are the cookies invidividually wrapped? What are the cookies cooked in?